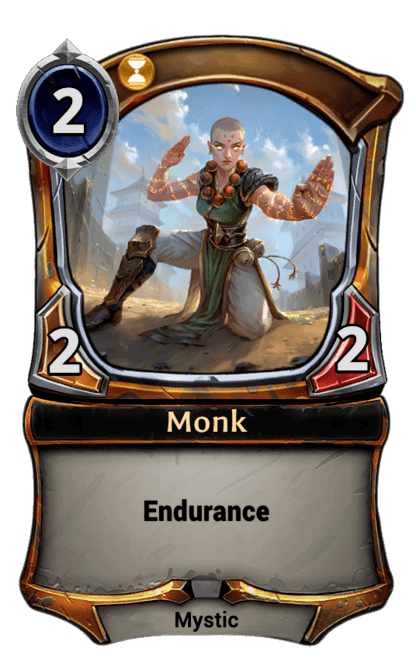 Endurance is Eternal's vigilance, and stun is its super-tap, but their implementation and relationship are worth talking about. Vigilance means your creature doesn't tap to attack, so that it'll be untapped during your opponent's turn and available for blocking. Endurance serves the same end, but achieves it by refreshing your unit at the end of your turn. At face-value, those are identical, but vigilance lets you also tap your creature for some effect, and endurance will ready your unit for defense no matter how you exhaust it. The difference between Harmless Question and Permafrost is neat, by the way: Stun can be a one-time temporary effect, or ongoing as long as the stunning card survives, as on Ice Sprite. This design decision gives players a counter to stun-heavy strategies: I'm sideboarding Infinite Hourglass for you, Permafrost and Icebreaker. The choice is not without downsides, as this complicates things slightly and endurance doesn't really have a weakness (where I can totally Twiddle a Serra Angel in Magic). 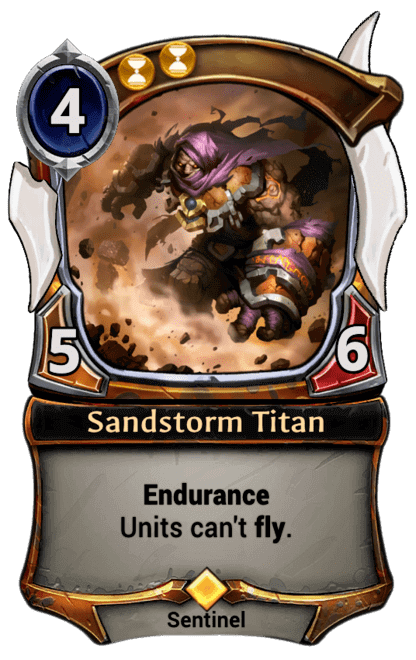 Most endurance units aren't a big problem, but I can't not mention one of the strongest cards in the game, Sandstorm Titan, and how it shuts down games all on its own, just as an undercosted Skysnare Spider would. There is one card that preys on endurance, and they just gave it an upgrade so that it also preys on lifesteal units: Ankle Cutter. I still don't know any relevant decks that run it (even Oni tribal). But again, except for the titan (which still dies to Annihilate, Vanquish, and most good removal above Torch) it's not like endurance units are ubiquitous and slowing a lot of games down. Endurance and stun aren't a huge facet of the game, but they are common and significant. The only tweak I'd suggest is making ready effects interact with stun effects too. Another wrinkle of stun: You can stun a unit after it attacks to remove it from combat. In Magic, you've got to tap a creature before it attacks, and this is a bit more intuitive (if you're not used to Magic). This applies the same to blockers.